The name of Coalbrookdale is the first name that comes to mind when considering iron garden furniture. Although founded in 1709 by Abraham Darby, the village in Shropshire was at the forefront of the Industrial Revolution and produced some noteable ironwork, not least the gates to Hyde Park in London. However, many a Victorian garden was furnished with a Coalbrookdale iron bench in patterns such as Nasturtium from the 1875 catalogue, Horse Chestnut, Fern and Blackberry, Moresque and Water Plant from a design by Christopher Dresser. Additionally, the Coalbrookdale foundry manufactured items including bootscrapers, garden fountains, hall stands and fire surrounds. A Liberty 'Tara' Terracotta Garden Bench Designed by Archibald Knox and Produced by Carter and Co, Poole, 1905 (FS18/887) sold for £6,500 at auction in April 2013 at our salerooms in Exeter, Devon. A rare item of Garden furniture was sold by Bearnes Hampton & Littlewood in April 2013. 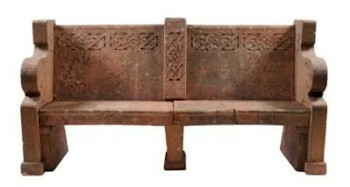 This was a Liberty Tara terracotta garden bench designed by Archibald Knox and produced by Carter and Co of Poole in 1905 for Liberty and Co to a Celtic design (FS18/887). It sold for £6,500. Portland stone was widely used in the manufacture of garden statuary from the 18th Century to the present day. Quarried on the Isle of Portland, the designs were often in the Neo Classical style. The Cenotaph is constructed of Portland Stone. Coade stone is a rare commodity. It was often described as artifical stone in the 18th and 19th Centuries and was used in the making of garden statues and garden statuary. Created in the 1770s by Eleanor Coade, who was born in Exeter in 1733, Coades 'artifical stone manufactory' was based in Lambeth from 1769 to 1821. After her death, it continued to be made until 1833 by her business partner William Groggon, who originated in Grampound in Cornwall. Lead is another material widely used in the manufacture of garden statuary. 18th Century lead water cisterns now being used as garden plant troughs and sets of cherubs modelled as the four seasons are often seen. Additionally, marble was widely used in the 18th and 19th Centuries, principally for Neo-Classical figures and seats.